It's easy to see how it gained its nickname, for the interesting dark grey veining is reminiscent of turquoise. This stone is a sophisticated grey-green colour, and the cut of these beads (I've tipped one on edge in the image so you can see better) is equally elegant. 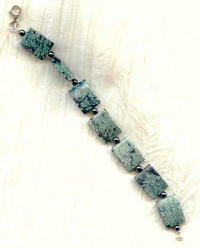 The African turquoise beads are spaced with 4mm hematite rounds which match the color of the matrix. The strand is about 7-1/4" long, and closes with a sterling lobsterclaw. Beautiful and well-priced, it's from SPARKLE PLENTY.